Located in the heart of the Calvados region close to the famous Omaha beach. This restored 19th century château holds a prime location. It offers a whole range of services that you should not miss out on. Upon entering along your own private road and through the door you will notice the eight bedrooms and eight bathrooms, housing a maximum of 15 guests. The house is equipped with a spacious dining room, a kitchen and games room with a billiards table. Just outside the main building there is a gym and a games room for your children filled with lots of toys. They always seem to really enjoy their stay at the château as much as their parents do! The heated pool is gated minimising any fear that you might have of your children falling in. The grounds are picturesque and maintained throughout the day. Should you require any additional services or amenities we will be happy to provide them. If you need more space we have two more cottages on this property that can also be rented out. (La Chapelle - 4 Bedrooms and 2 Bathrooms - 8 People max., as well as Le Presbytaire - 5 Bedrooms and 3 Bathrooms - 14 People max.). Our goal is that you have a marvellous holiday. Please visit our website for more information and don't hesitate in contacting us if you have queries of any kind. We speak English, French and German. Our agency is based in Germany and we give every property the once-over before advertising it, so that you can rest assured that we list only the highest quality properties for your convenience. Included in the price: electricity, water, towels for the chateau plus pool and all other costs. You can ask us after the booking for a housekeeper or chef on demand. We can suggest you a great cook who cooks 5 course menues for about 40 eur per person, everything included. Daily cleaning available at 20 EUR per hour. There is also an addional cleaning fee to be paid upon arrival. If you need a cot or anything - no problem - just tell us. Location: Located in Normandy, a region in North France, famous for Le Mont Saint Michel and other picturesque medieval attractions. The estate of the Chateau is gated, with access only via private road, making it all the more secure. The chateau itself is very prominently located: only a 10 minute drive from Bayeux - an attractive old Norman town where the historic Bayeux tapestry has been preserved for 900 years after it was made. It is also extremely close to Omaha Beach: the site of the D-Day landings in World War 2 and just a 30 minute drive from Caen. 1.Chambre Baldaquin (Canopy Bedroom) - This very romantic and spacious dual aspect room is bathed in sunlight all day long. It has the look and feel of 19th Century Parisian residences. A 20m² bedroom for 2 people with one 160 cm wide canopy bed with a footboard and a bathroom with shower and WC. 3.Chambre Alcôve (Alcove Bedroom)- This room has a double bed nestled in a lovely alcove and walls shrouded in hung fabrics, it will transport you to a calm and peaceful place. You will have a perfect view of the grounds and the countryside beyond. The bathroom has a beautiful freestanding 18th Century bath tub and a WC. This very light 16m² bedroom for two people has a 170 cm wide bed without footboard and a bathroom with bath tub and WC. 4.Chambre aux Roses (Rose Bedroom) - This double bedroom is completely unique as it actually integrates the bathroom into the room itself, perfect for a romantic and titillating weekend break. It can be adjoined to the 'Chambre de l'Ecrivain' to create a family suite. 16m² bedroom for 2 people with a 160 cm wide bed without footboard and a bathroom with WC. 5.Chambre de l'Ecrivain (Writer's Bedroom) - A beautiful, spacious and light double bedroom, ideal for reading or writing. From it's private balcony you can enjoy the château grounds and the beautiful Normandy sunsets. 20m² bedroom for two people with two 90 cm wide beds with footboards. It has a bathroom with a shower and WC. It can be adjoined to the 'Chambre aux Roses' to create a family suite. 6.Chambre de la Tourelle - Beautiful spacious bedroom with views of the château grounds and the swimming pool. You will also have an impressive view that extends over the Normandy countryside. It's bathroom is tucked-away in one of the château's little turrets. 20m² bedroom with a 160 cm wide by 2.20 m long bed with a bathroom with shower and WC. 7.Chambre du paix - with a garden view and entry. One of our newest and most refurbished bedrooms. Spacious, and due to the direct garden entry, made for handicapped. No steps to walk outside. Bed of 180x200 meters and private bathroom. 8.Children's room - with one queen size and two single beds with integrated bath underneath the roof - very comfortable and cozy. At Private Properties, our team of professionals are here to help clients discover their ultimate dream vacation. Each member of the team contributes in their own way to ensure that clients renting through our platform can locate, compare and book their selected luxury rental through an easy and care free process. We understand that booking both short and long term vacations can be a tedious task, which is why our group of qualified individuals have developed this user friendly platform, which will guide clients through their booking process with ease and transparency. Once a client has located their perfect property, they can then speak with our professional sales team, who draw on their vast years of experience in the travel market to advice clients and provide the highest possible level of customer satisfaction. Really enjoyed the house and pool. Great set up for large families of groups of families. Everything worked and loved the kids play room - a must for young ones. Great location for the sites and a place to chill. Highly suggest booking the chef for a few nights for the adults. It was nice to unwind and have the food taken care of after the kidos go to bed. Thanks so much for your nice review ;-) looking forward to see you back next year! 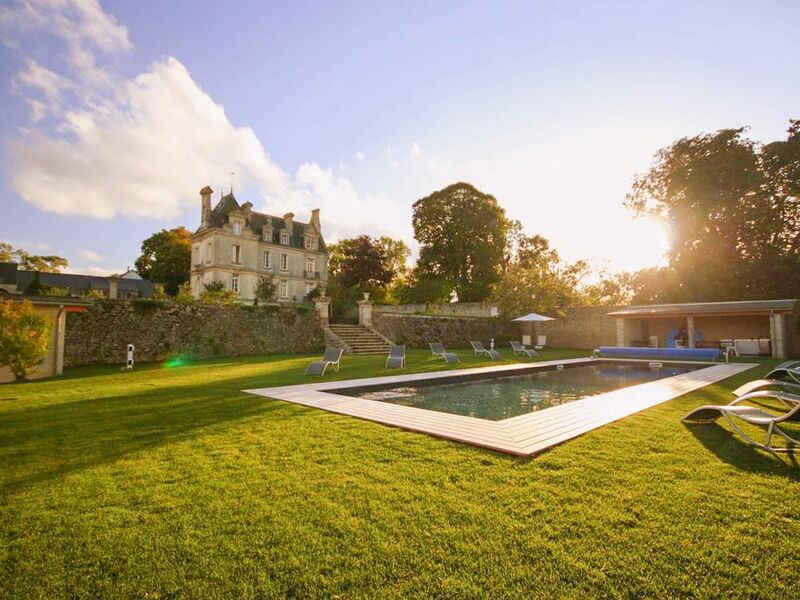 The chateau was a fabulous venue for a group holiday to celebrate a birthday with family. It was kept immaculately clean with all of the bedrooms being comfortable & appealing. The kitchen is very well equipped with many meals enjoyed al fresco including some BBQs. The pool area is wonderful with a covered eating area & kitchen facilities. The games room was perfect for toddlers with plenty of toys to keep them entertained. The trampoline & slide were also enjoyed. Outdoor boules (balls provided) was great fun. Bayeau was only 15mins down the road and it was a lovely place to explore. Food shopping was also there for supplies. The only negative we found was a big hungry dog scrounging at dinner time! Hey Jenny, thanks for your great review! Absolutely loved this house in Mosles,France. The house is perfect size for me,my husband and our children with our family friends and their children.Home is very personable and charming.Very comfortable bed with excellent crisp linens. Kitchen is very well stocked with anything one would need. Garden is great for meals and relaxing. Enjoyed strolling the neighborhood and meeting several neighbors. We have stayed in many homes throughout our travels and this is hands down the very best place we have stayed.This house has all the comforts one would wish for. Hope we can return one day. We stayed here for a wonderful week in the middle of July. We were 2 families of 6 with kids from 3 to 16 and 2 grandparents. We also had another 2 friends stop in for a weekend. The house was really perfect and the photo's don't lie. There was loads of space for us all. The pool was a welcome break from some of the really hot days we had and although it was heated there was no need for that for us. The house was beautifully presented and very clean when we arrived and had everything we needed. We went on several day trips from here and it was all very accessible. The host was really nice and helpful and we would highly recommend this place to everyone. We used the barbeque pretty much every evening except the one where we fine dined in restaurant in the town. I can't rate this place highly enough. We travelled from Australia and met up with our families still living in Ireland and the UK and had the most wonderful week. We spent a beautiful time in Normandy and were fortunate to find this home as the perfect place for our family to reunite. Communication and booking process was very easy and pleasant.The home is large with plenty of space for everyone. Each bedroom has either a connecting bathroom or it's own bathroom/shower facilities. Photos on websie are not enough to show how warm and cosy the bedrooms are. It is laid out over three/ four storeys so you will get your exercise. The kitchen is large and well laid out. Practically everything you need is there at the home. We spent plenty of time in the kitchen, preparing meals and drinking wonderful French wine.The living room has a natural wood burning fire place and really comfortable furniture, and this in turn leads to a TV room. Never at any point did the house feel crowded with 18 people. The pool with its heating system located in the yard adds pleasant feelings to your stay. Unbelievable holidays in this property! We were group of friends friends with wifes and children on a tour of the Normandy battlefields! The Chateau is well placed, in a quiet location with its fine restaurant choices and shops located not far from it. Beds are comfortable, bathrooms well equipped, and all rooms are clean and spotless. There is plenty of private parking if required, and a sheltered walled garden in which to enjoy the sun, rare on our trip but we managed a couple of evenings outside for an hour reviewing our day over a glass of wine or two. Private swimming pool with heating system made our holiday more enjoyable! The châteaux is located in a peaceful area not far from Bayeux. Mont Saint Michel and Deauville are both reachable within an hour and both make excellent day trips. Away from the stress of everyday life, this holiday rental offers relaxation and simply rediscover some of that joie de vivre. Also, if interested we can send you a guide about all the amenities of the area, the best French restaurants and other exciting things to do and see to assure you the perfect holiday with us! The region offers some exciting prospects and characteristics to discover: history about the scars left by WWII which are not very far away and easily accessible by bicycle.